In some countries, such as Bangladesh, the United States, Pakistan and India, it may apply to all armed forces, not just the navy. This means generals can also be considered flag officers. In India, it is applied to brigadiers, major generals, lieutenant generals and generals in the Army (and their equivalents in the Navy and Air Force). The equivalents are commodore, rear admiral, vice admiral and admiral in the Navy and air commodore, air vice marshal, air marshal and air chief marshal in the Air Force. Each of these category of flag officers is designated with a specific flag. India's honorary ranks (five star ranks) are field marshal in the Army, marshal of the Indian Air Force in the Air Force and admiral of the fleet in the Navy. In the Royal Navy, there is a distinction between "flag officer" and "officer of flag rank". Formerly all officers promoted to flag rank were considered to be "flag officers" and the term is still widely used to refer to any officer of flag rank. Present usage is that all rear-admirals and above are officers of flag rank, but only those officers of flag rank who are authorised to fly a flag are formally called "flag officers", and have different flags for different ranks of admiral. Of the 39 officers of flag rank in the Royal Navy in 2006, very few were "flag officers" with entitlement to fly a flag. For example, Commander-in-Chief Fleet flies an admiral's flag whether ashore or afloat and is a "flag officer"; the chief of staff (support), a rear admiral, is not entitled to fly a flag and is an "officer of flag rank" rather than a "flag officer". List of fleets and major commands of the Royal Navy lists most admirals who were "flag officers". A flag officer's junior officer is often known as "Flags". Captain was the highest rank in the United States Navy from its beginning in 1775 until 1857, when Congress created the temporary rank of Flag Officer, which gave way to Commodore and Rear Admiral in 1862. The rank of "flag officer" was bestowed on senior Navy captains who were assigned to lead a squadron of vessels in addition to command of their own ship. During the American Civil War, the Confederate States Navy also used the term. 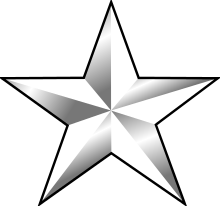 The 19th-century rank of "flag officer" was considered strictly temporary and became obsolete upon the creation and widespread usage of the equivalent naval rank of commodore; however, the term is still in use today, explicitly defined as an officer of the U.S. Navy or Coast Guard serving in or having the grade of admiral, vice admiral, rear admiral, or rear admiral (lower half),  equivalent to general officers of an army. In 1862 Congress authorized American use of the title "admiral." In the United States Army, Air Force, and Marine Corps, the term "flag officer" generally is applied to all general officers authorized to fly their own command flags—i.e., brigadier general, or pay grade O-7, and above. However, as a matter of law, Title 10 of the United States Code makes a distinction between general officers and flag officers. Non-naval officers usually fly their flags from their headquarters, vessels, or vehicles, typically only for the most senior officer present. In the United States all flag and general officers must be nominated by the President and confirmed by the Senate; each subsequent promotion requires renomination and re-approval. For the Navy, each flag officer assignment is usually limited to a maximum of two years, followed by either reassignment, promotion and reassignment, or retirement. ↑ Canada – National Defence: A-AD-200-000/AG-000 The Heritage Structure of the Canadian Forces, Chapter 14, Section 3. ↑ Canada - National Defence: "Navy Rank and Appointment Insignia: Navy"
↑ Note: The referenced website, above, has not yet been updated to reflect the change as of July 9, 2010. ↑ "Naval History and Heritage Command - Navy Captain". History.navy.mil. 13 May 2014. Retrieved 8 June 2016. ↑ Offenhauer, Priscilla. "GENERAL AND FLAG OFFICER AUTHORIZATIONS FOR THE ACTIVE AND RESERVE COMPONENTS: A COMPARATIVE AND HISTORICAL ANALYSIS" (PDF). Library of Congress. Retrieved 15 August 2015.